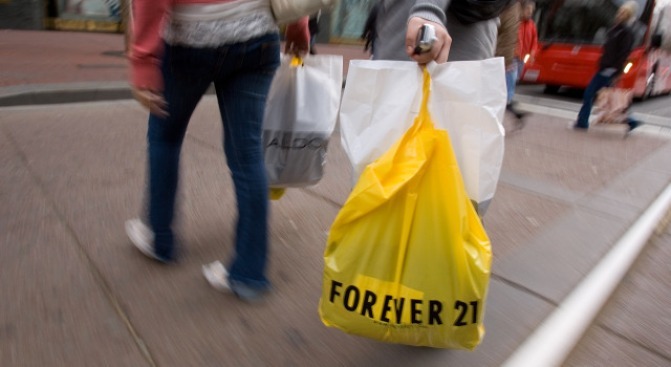 Forever 21 is hit with a new copyright infringement suit, the latest of several for the brand. Clothing chain Forever 21 is facing more accusations that some of the discount goods they've been selling are, in fact, copies. The legal woes for fashion superstore Forever 21 continue this week as national chain Express filed a lawsuit citing infringement of both copyright and "trade dress," a legal term for the visual look or characteristics of any item for sale. In the complaint, Express cited in particular four men's shorts and a track jacket designed and sold by Express in 2007 and 2008, then allegedly copied by Forever 21. The complaint even goes a step further to say that Forever 21 has been "engaged in a pattern of 'shop and copy'" for quite some time. Take, for example, a lawsuit that clothing brand Trovata brought against Forever 21 for the same reason. (The lawsuit recently ended in a mistrial.) And they weren't the only other ones: Gwen Stefani sued the chain in 2007, saying that they'd lifted the logo design from her Harajuku Lovers label for use in some of their pieces. We have to admit, the pieces do look eerily similar (as did the pieces Trovata accused Forever 21 of copying). But at the same time, don't we all get a cheap thrill from knock-offs?